Hoop Nut #UAAP78 Ateneo Blue Eaglets Juniors Division UAAP #UAAP78Jrs Roundup: Bullpups and Junior Archers continue to distance themselves from the rest of the field. #UAAP78Jrs Roundup: Bullpups and Junior Archers continue to distance themselves from the rest of the field. National University moved three wins of a season sweep and an outright Finals berth with an 82-58 blasting of University of Santo Tomas in the UAAP Season 78 Juniors’ basketball tournament at the Filoil Flying V Arena yesterday. Justine Baltazar and the Bullpups continue to dominate the Juniors' Division in #UAAP78. 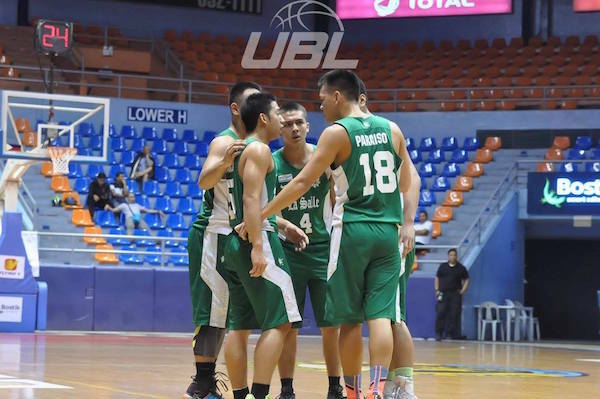 The Bullpups, who are already assured of a post-season slot, led by as many as 31 points to extend their unbeaten run to 11 games. John Lloyd Clemente had 14 points, while Justine Baltazar chipped in 13 points and 12 rebounds for NU. 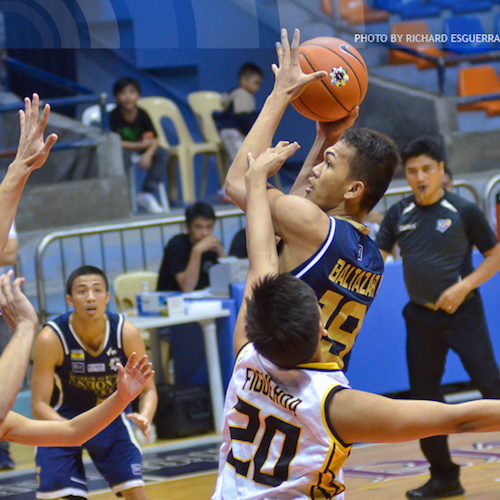 The Tiger Cubs, meanwhile, drew a combined 21 points from Carl Lacap and Marlon Navarro. As for De La Salle-Zobel, the Junior Archers assured themselves of a playoff for a semifinals spot with an 85-74 win over UP Integrated School. The Junior Maroons actually had a great start here, leading by 6 points after the first ten minutes, but the Greenies of coach Boris Aldeguer righted the ship in the second period and kept UPIS at bay till the final buzzer. The Junior Archers are on-track to finish as the second seed after the elims. Not surprisingly, Aljun Melecio was at the forefront of the Junior Archers’ attack again, scoring 22 points and grabbing 8 rebounds. Marco Sario also did very well, putting up 19 markers on the strength of 5 triples. 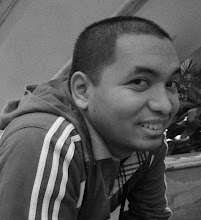 The Junior Maroons were paced by Juan Gomez de Liano’s 22 points and 13 rebounds. Later in the day, defending champion Ateneo overcame a slow start to beat University of the East, 96-58, and cement their place at solo third. The lowly Junior Warriors gave the Eaglets a helluva fight in the first half, trailing by just 4 points at the break, but the Loyola quintet were able to find their bearings in the second half. 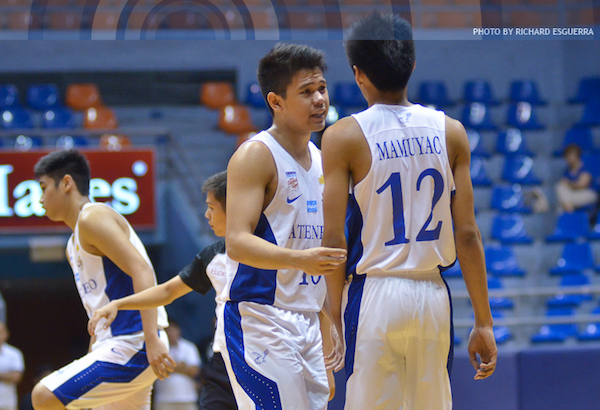 Batang Gilas stalwarts Jolo Mendoza and Gian Mamuyac are the main guys for Ateneo. Jolo Mendoza broke out of a shooting slump to score 25 points against the Reds, who are not eh league’s glorified spoilers. By far the biggest story of the day, however, was Far Eastern University-Diliman’s triumph over the Adamson University Baby Falcons 60-55. This came at the heels of the Baby Falcons putting a big scare into the hearts of the Bullpups. Adamson started strongly, outscoring FEU-Diliman, 20-8, in the first stanza, but things were soon to unravel for the Baby Falcons. FEU trimmed the deficit to just one at the half and dominated Adamson in the final frame to get their sixth win in eleven matches. JJ Sapinit helped the Baby Tamaraws keep in-step with the Baby Falcons after winning yesterday. 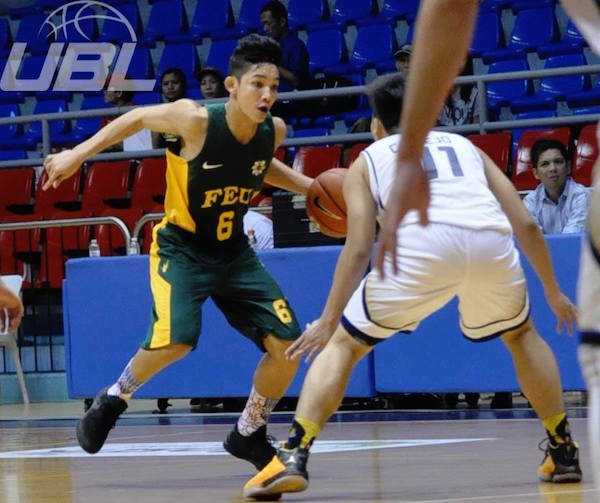 Jun Gabane shot 18 points, while Kenji Roman had a double-double effort of 12 points and 15 boards as the Baby Tamaraws joined the Baby Falcons at 6-5, bolstering their semis hopes. The Tiger Cubs are virtually out of the running with a 3-8 slate in sixth spot, while the Junior Maroons (2-9) and the Junior Warriors remain at the bottom of the standings.